Hello Folks! 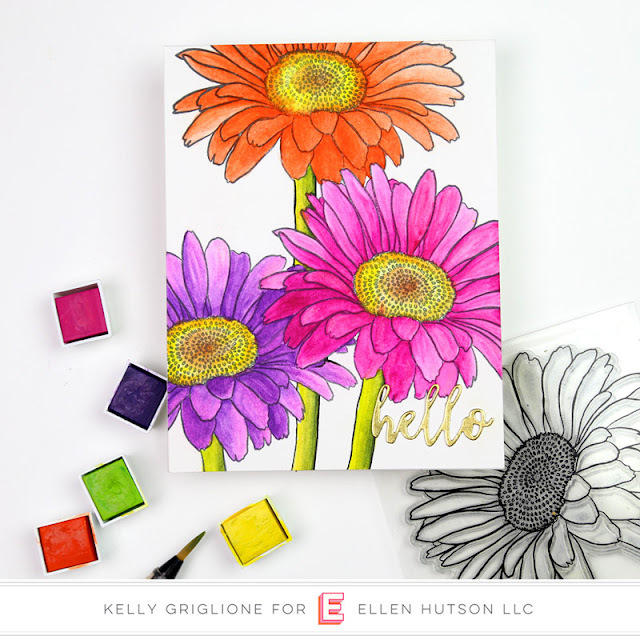 I know all the Mondo flowers by Ellen Hutson are always super popular, but there is one being released TODAY that I'm especially fond of ... the Mondo Daisy! 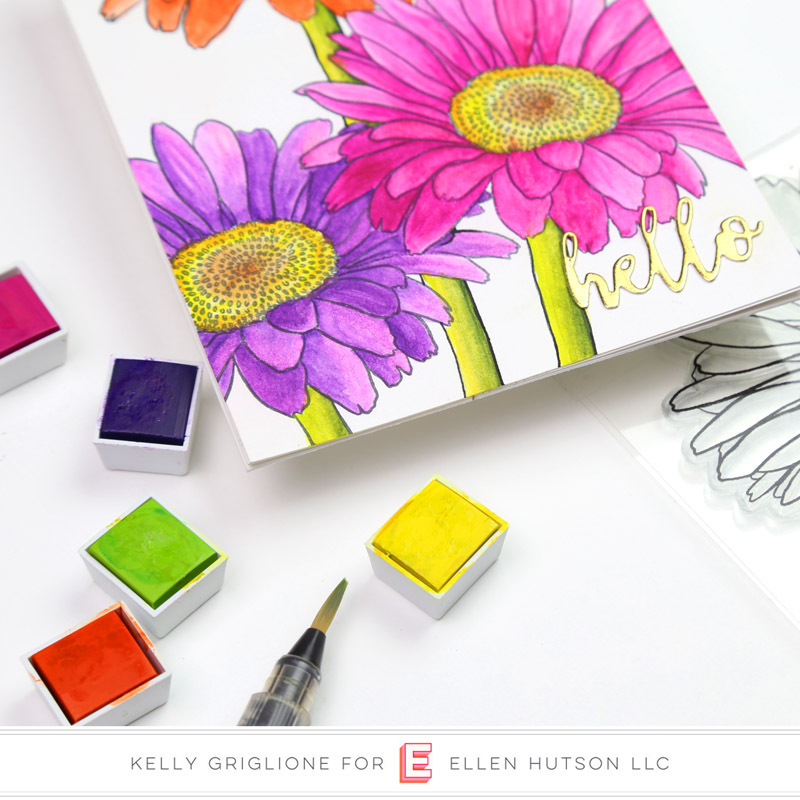 I'm not a master at using 20 different shades to color in a flower that has petals going in 20 different directions, so this flower is perfect for me to pick one shade to color with, or to even just leave it white! I love how with just a few shades of grey, you can "color" your typical white daisy. I added some gold sequins in the center for some sparkle to this quiet card. The "friend" die cut is actually a bonus that comes with the die set for the daisy. You also get "hi". This card highlights the darling little lady bug that also comes with the set! I put some glossy accents on her, naturally. Isn't she cute?! The sentiment is actually a hybrid ... I took the "thank you for every little thing" and turned it into "hello little thing" because, well, the cute little lady bug! I thought this would make a really fun baby card, and something a little different. I also chose to make the sentiment red to compliment this little fella. 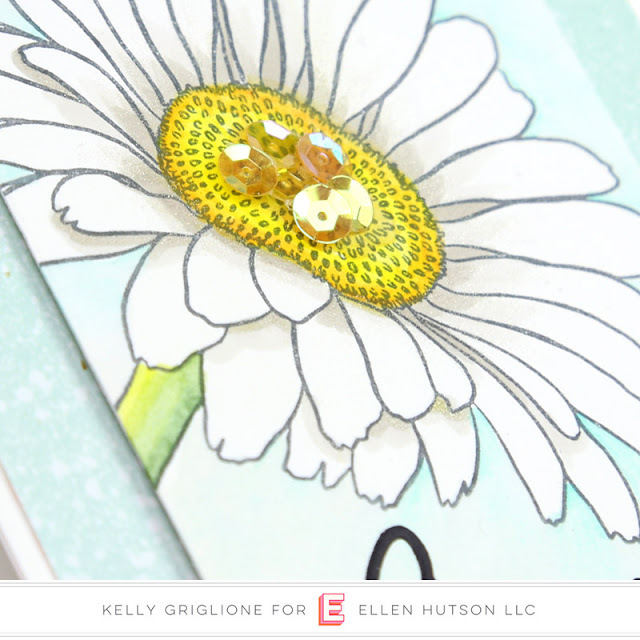 Going along with the white daisy theme, here's another card, featuring multiple daisies. Now how about some COLOR?! This card is actually the same as the last card, only flipped, and colored. What do you know, we found a lucky lady bug right in the center! I purposely put the lady bug right above the word "lucky." On the side I have the "friend" die, going vertically. I didn't want to give it the attention it would take being horizontal, because I wanted the smaller sentiment to be the main thought. To further put it in the background, I chose to make it white, the same color as the background. I like having something there to take up the space, however. This card definitely has a lot more "stuff" on it than I usually include, but I do like it. It's somewhat scrapbookish, I think. 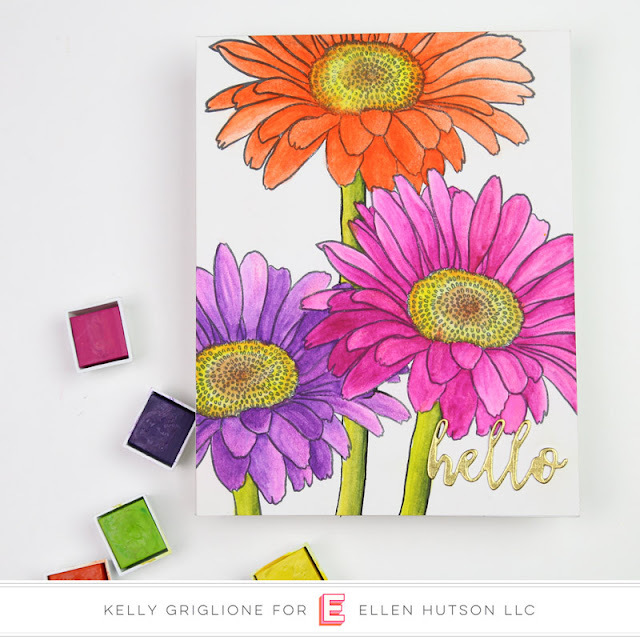 Finally, I thought I'd go all out and put three large gerbera daisy blooms on one card! These flowers always have nice long stems, so I extended them with a felt tip pen. Hopefully, you can't even notice this, and they just look like long flower stamps. The coloring was straightforward because each bloom is only one color. Just like in nature, for the most part. Sure hope you liked the Mondo Gerbera Daisy just as much as I did! Stay tuned, I have more projects coming tomorrow! Wow Kelly, so much prettiness! 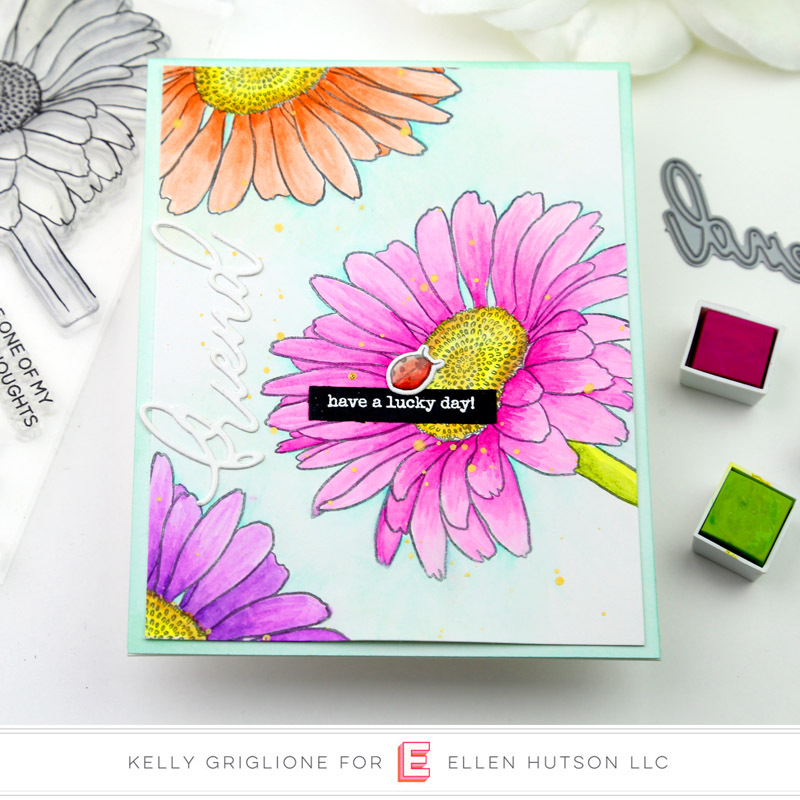 gorgeous cards, the daisy is fabulous. 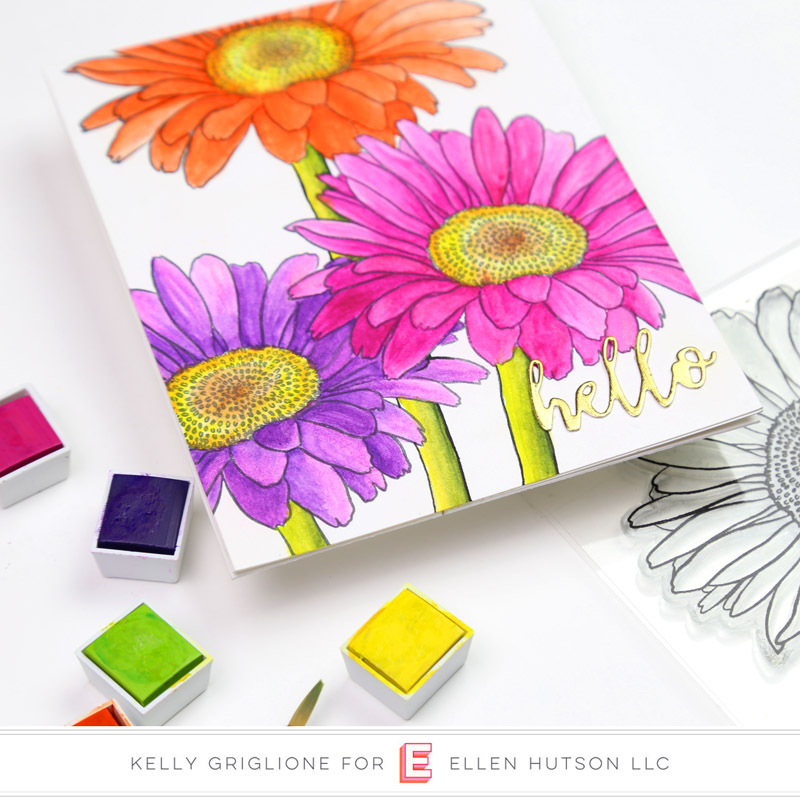 I love, love all of your "Mondo Daisy" cards Kelly! My favorite is the one with the ladybug, so adorable!! Thanks for the inspiration! You have more projects with this set?! I'm already in awe, Kelly! You are amazingly creative & love that you've given us non-colorers some inspiration! I love every single card, but I'm especially drawn to the first one--so beautiful! Whoa! You wowed my pants off, Kelly! The focus on the ladybug and the last card are my faves. Heck, I love 'em all! Daisies are my favorite flower and I hemmed and hawed about buying this one since I have a few others. After seeing your remarkable cards, Kelly, I think you've pushed me off the fence and into the shopping cart.